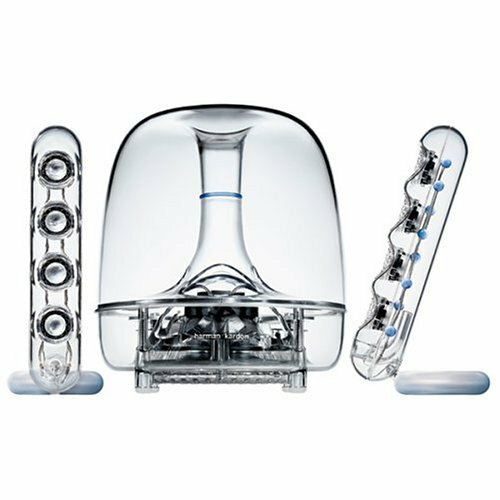 Harman Kardon’s 40-watt SoundSticks II three-piece speaker system produces high-quality stereo sound for music, MP3’s, movies and gaming experiences. The mini stereo jack connection allows you to enjoy awesome audio from a variety of devices such as digital music players, computers (all platforms), stereos and portable listening devices. Touch Volume Control – Just a touch increases or decreases the volume. Just a touch mutes or un-mutes the system. SoundSticks II also remembers your last volume setting. 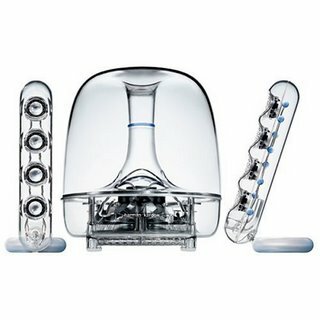 The SoundSticks II audio system utilizes a straightforward interconnect technology, which provides an effortless user interface with minimum desktop wiring. The powerful subwoofer provides clean, low bass. The treble and subwoofer level controls are located on the back of the subwoofer.